Published on November 30, 2009 in CARICOM, CHOGM and International. 4 Comments Tags: Commonwealth, Patrick Manning, Politics, T&T Govt. 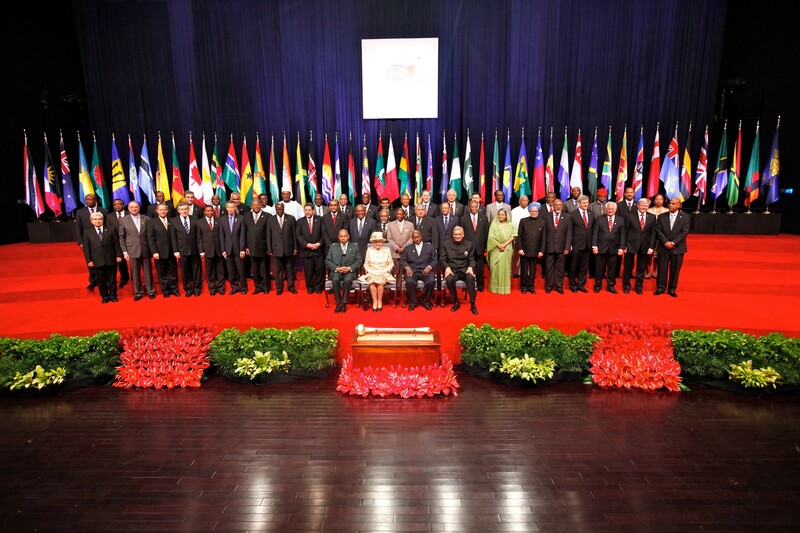 COMMONWEALTH leaders yesterday paid glowing tribute to Trinidad and Tobago for hosting one of the most successful Commonwealth Heads of Government Meetings (CHOGM) in the 60-year history of the organisation. The leaders paid their tributes as they delivered their closing statements in the presence of local and international journalists during the final executive meeting of the CHOGM in the Port-of-Spain ballroom of the Hyatt Regency Hotel and Conference Centre. Published on November 28, 2009 in CHOGM and International. 2 Comments Tags: Commonwealth, Patrick Manning, Politics, T&T Govt. 1. Climate change is the predominant global challenge. We convened a Special Session on Climate Change in Port of Spain to discuss our profound concern about the undisputed threat that climate change poses to the security, prosperity, economic and social development of our people. For many it is deepening poverty and affecting the attainment of the Millennium Development Goals. For some of us, it is an existential threat. Published on November 28, 2009 in CHOGM and International. 8 Comments Tags: Commonwealth, Patrick Manning, Politics, T&T Govt. This diamond anniversary year is an important time for the Commonwealth to look back – and, more importantly, look forward. In doing so, I believe we can be pleased with how far the Commonwealth has come in its 60years, and yet how true it has remained to its origins. But this does not mean we should become complacent or rest on past successes. Like any good organization we must continue to pay close attention to the things that give it distinctive character. Published on November 28, 2009 in CARICOM, CHOGM and International. Closed Tags: Commonwealth, Patrick Manning, Politics, T&T Govt. 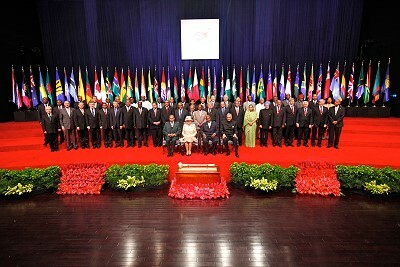 HER MAJESTY Queen Elizabeth II yesterday called upon Commonwealth leaders to adopt Trinidad and Tobago’s national motto in order to find consensus on burning issues such as climate change, during their deliberations over the next two days at their meeting at the Hyatt Regency in Port-of-Spain. 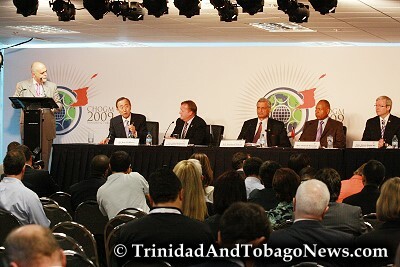 Published on November 27, 2009 in CHOGM, General T&T, International and Politics. 3 Comments Tags: Commonwealth, Politics, Queen Elizabeth 11, T&T Govt. 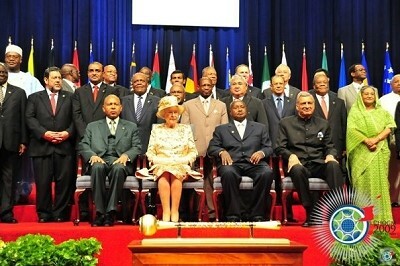 Remove Her Majesty Queen Elizabeth 11 as symbolic Head of the Commonwealth at the upcoming Commonwealth Heads of Government Meeting in Port-of-Spain. This is the call coming from some students attached to the St Augustine campus of the University of the West Indies. Students from U We Speak, a student advocacy group, made the call during a powerful rendition of poetry and song last Wednesday night, one week before the Commonwealth Heads of Government Meeting (CHOGM) in Port-of-Spain. A student crowd assembled at the Humanities Undercroft from 8 pm to support performances centered around the call for the removal of the Queen as Commonwealth Head. Published on November 27, 2009 in CARICOM, CHOGM, International and Politics. 19 Comments Tags: Commonwealth, Politics, T&T Govt. 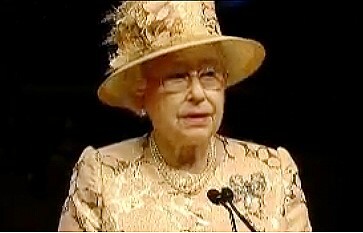 HER Majesty Queen Elizabeth II is here. Her British Airways Boeing 777 jet airliner touched down yesterday at Piarco International Airport at exactly 2.44 pm, after a four-hour flight from Bermuda. 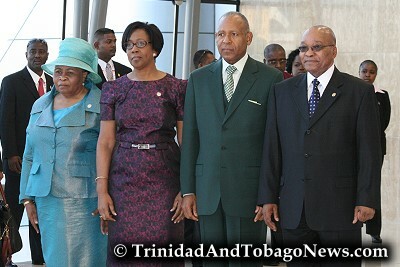 After a 15-minute wait at the end of the runway, in which time local dignitaries including President George Maxwell Richards and Prime Minister Patrick Manning took their positions on the tarmac, the plane taxied up to the red carpet. British High Commissioner to Trinidad and Tobago, Eric Jenkinson, and local Chief of Protocol, Reitha Toussaint, ascended the stairs and entered the craft. A senior British military officer descended to join the waiting party at the foot of the stairs. Published on November 26, 2009 in CARICOM, CHOGM and International. Closed Tags: Commonwealth, Politics, T&T Govt. 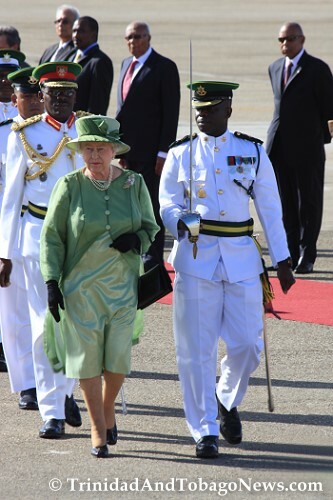 Her Majesty, Queen Elizabeth II, is due to arrive at Piarco Airport this afternoon, coming from a State visit to Bermuda with her husband, His Royal Highness (HRH) the Duke of Edinburgh. Her Majesty is visiting Trinidad and Tobago both for a State visit and in her role as Head of the Commonwealth which tomorrow launches its Commonwealth Heads of Government Meeting (CHOGM).